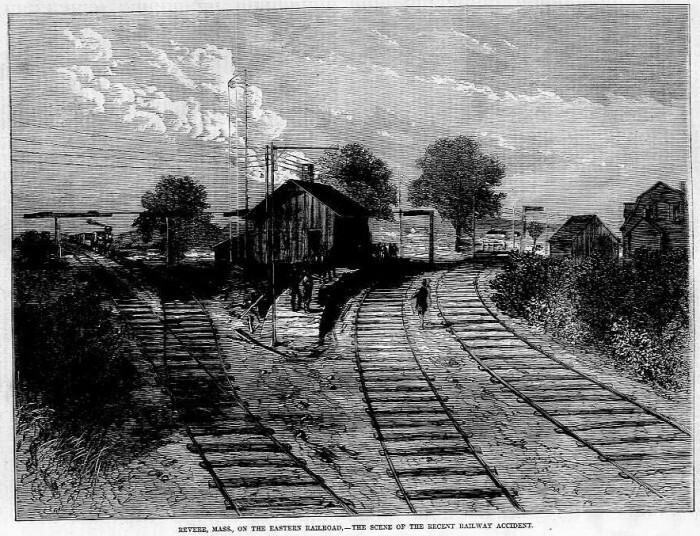 On the evening of August 26, 1871, the Eastern Railroad’s Portland Express slammed into the rear of a stopped local train in Revere, Massachusetts. It is reported that the night was very dark and the engineer of the express thought the lights on the rear car of the stopped local train were from the station’s lamps. The express managed to slow to 10 miles per hour, but at that point the collision had become unavoidable. The express train’s steam boiler exploded and about a dozen people were either crushed to death by the boiler or scalded by the escaping steam and hot water. Some trapped passengers were burned alive as coal-oil lamps ignited the wreckage. Approximately 29 people died, while several others were injured.